On the surface, sixteen-year-old Lesley Holloway is just another bright new student at Hawthorn Hill, a posh all-girls prep school north of London. Little do her classmates know that she recently ran away from home, where her father had spent years sexually abusing her. Nor does anyone know that shes secretly cutting herself as a coping mechanism...until the day she goes too far and ends up in the hospital. Lesley spends the next two years in and out of psychiatric facilities, where she overcomes her traumatic memories and finds the support of a surrogate family. Eventually completing university and earning her degree, she is a social services success story until she becomes unexpectedly pregnant in her early twenties. Despite the overwhelming odds she has overcome, the same team that saved her as an adolescent will now question whether Lesley is fit to be a mother. And so she embarks upon her biggest battle yet: the fight for her unborn daughter. What a raw and emotional story! I don't know how else to say it. I devoured this novel, but in no way was it an easy or a light read; It is heavy and heart-wrenching. A beautifully written story that will have you caring so deeply for a teenage girl named Lesley. It has been a while since I had a book surface almost all the emotions a human can have in one reading experience. I laughed and I cried(more than once!). I got angry and at times disgusted(mostly at any mention of Lesley's father). Crowell's writing style was superb. She delivered this beautifully haunting novel in such a simple way. No bells, no whistles; She just put Lesley's story to paper, and let the rest do it's job. As mentioned before, this is a novel that will not tread lightly on your heart. You will feel many things while reading this. There will be moments that will make you cringe, but there will also be a crack of sunshine along the way. This is my first novel by Jenn Crowell, but I am an instant fan! Wonderful review! You have completely piqued my interested. Definitely going to check this one out. Thanks! 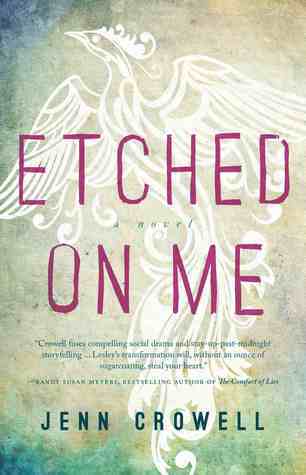 Thank you so much for reviewing Etched On Me! I'm so glad you enjoyed it. That is good decision to write the above book and we should work for the Education of Murdered Officer’s Kids. All educational responsibilities of his kids on this Foundation. I think these foundations are good for the welfare of the society and this kind of cases. Actually, I have a question which is custom written dissertations work and which way is suitable and best for writing a best essay. The Book Thief Blu-Ray Giveaway!